ST. CLAIRSVILLE, OH (March 1, 2018) – A growing demand for mappers and surveyors from the Ohio Valley’s energy industry has led to a new partnership between Belmont College and The University of Akron (UA). The joint effort means students can earn a bachelor’s degree in surveying and mapping starting this fall without ever leaving the St. Clairsville campus. Students will obtain the degree exclusively at Belmont College through UA’s College of Applied Science and Technology. Belmont College and The University of Akron recently announced a partnership to offer additional degree opportunities for local residents. 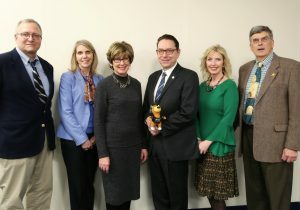 Gary Schuller, Professor and Program Director, Surveying and Mapping, The University of Akron; Dr. Elizabeth Kennedy, Dean of The University of Akron’s College of Applied Science and Technology; Dr. Rebecca Kurtz, Vice President of Academic Affairs & Student Engagement, Belmont College; Dr. Paul Gasparro, President, Belmont College; Annmarie O’Grady, Program Manager, The University of Akron; and Ed Mowrer, Energy Institute Manager, Belmont College. Students attending Belmont College can currently take select courses from a variety of areas related to land surveying to receive an associate of arts degree. Now, by completing six University of Akron bridge classes onsite at Belmont College, they can also earn an Associate of Applied Science in Land Surveying. Completion of those degrees will allow students to directly enroll into UA’s Bachelor of Science in Surveying and Mapping program. The bridge courses and bachelor of science classes will be taught onsite at Belmont College. occasionally use drones to help determine topography of land for energy facilities and pipeline transportation. Founded in 1971, Belmont College is one of 23 community colleges in the University System of Ohio. The college offers more than 40 associate degree and certificate programs to serve the multiple needs of area citizens. Belmont offers a comprehensive array of credit and non-credit programming at the Main Campus in St. Clairsville, Ohio and provides satellite locations in Cadiz and Woodsfield, Ohio. For more information, visit belmontcollege.edu. The University of Akron (UA) is the region’s most influential public research university, contributing to the resurgence of the local economy, providing a highly skilled workforce and known for an innovative approach to higher education. With more than 22,000 students and 300+ associate, bachelor’s, master’s, doctorate and law degree programs, UA offers career-focused and experiential learning. From polymers and psychology, to engineering and communications, to business and education, UA brings together distinct fields of study in ways that provide students with valuable real-world learning opportunities. To learn more, visit www.uakron.edu.